Naturally, I seek to swap out my brand name bikes with Campie Design Studio frames. 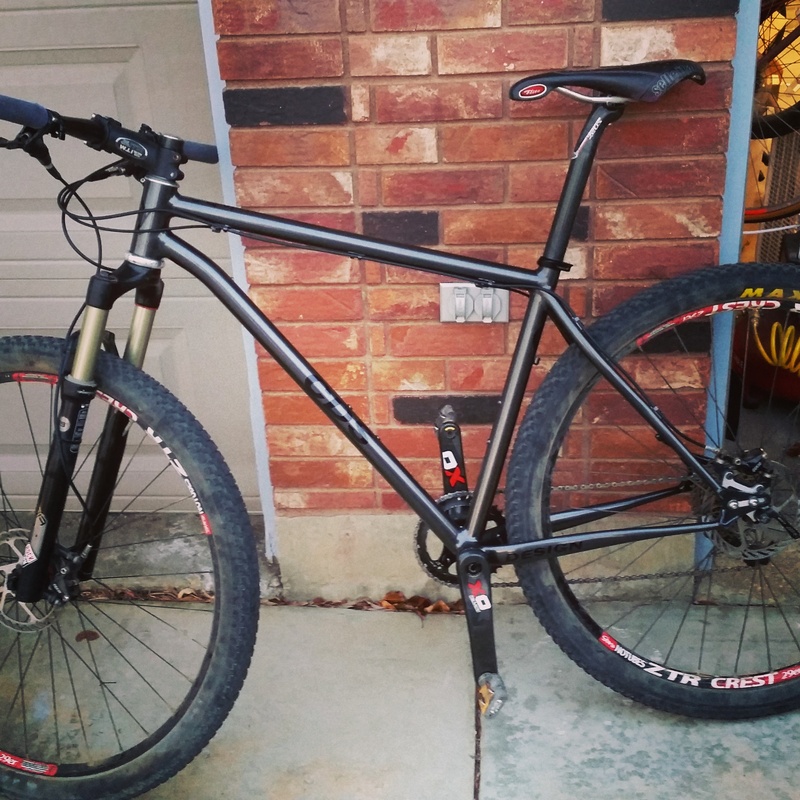 I’ve had the road and cross bikes for a while, but I hesitated to attack the mountain bike. I don’t get out on the trail enough and I was very satisfied with my Frankencross bike that I’d ride some gnarly single track on. However, I crashed on the Colorado trail on a rocky decent and broke the seat stay when it hit an angular rock. This prompted me to fix it and then just decide to build a more race focused cross frame. Although my new cross frame has enjoyed some serious single track exposure, it isn’t quite the geometry that made the Frankencross the capable machine that it was. Let’s face it, it was time to address the mountain bike issues in the stable. At first I considered a super light 26 inch bike, but after riding a 29er I knew it was they way to go. So I began the research on geometry and how that relates to my own ride preferences. It was clear that many of the challenges of going to the bigger wheel size evolved around geometry – wheel base, stand over and quick yet stable handling. The benefits of the greater rolling diameter was often offset by weight and speed of handling. I prefer to be over my bottom bracket more than standard and I also needed to tuck that rear wheel as best I could to keep my wheel base shorter. In some ways, conflicting goals. I also didn’t want a crazy steep head tube angle, there are too many long rocky descents in Colorado to consider making the front end too sharp.